Ryuujin's Inner world is a world that has been frozen over, a desolate ice land in a sense. It is extremely cold, although its temperatures doesn't affect Jushiro. The inner world in question is also rather mountainous and in the heavens is a rather large castle. It is from this large castle that Ryuujin normally descends towards Jushiro. There is no life apart from Ryuujin and Jushiro that share the same space in this world of ice. Release Phrase: The Heavenly Dragon Ascend to the Heavens and the World is Frozen Over! Once both blades take on their Shikai form. Both the Wakazahi and the regular Katana will reach up to 27 inches in length. The blades of the swords will become a black one with silver edges. On the sides of both blades, is a golden Chinese dragon. The dragon head ends close to the tip of the blades. While its tail stretches down towards the cross guard. The width of both blades will be 3 inches wide. The cross guard is also a Golden one made of a dragon’s head. The blades on both Zanapakutos will extend from the dragons mouth. The hilt of the swords will be the general length of a regular Katana blade. They’re also both Black with red trimmings on both of them. And from the end of the hilts will extending to figure out which techs nto use, a pair of sash. Both sashes will reach up to at least 12 inches in length and are of a dark red color. Upon the release of his Zanapakuto the weather would undergo a few changes, forming what looks like storm clouds. The weather would produce a cold front that will also be noticeable to his opponents. At times the thunder can be heard roaring through the heavens continuously. (Epic Effects Ftw) Ryuujin’s Rikka’s main ability during its Shikai stage is to create Ice and manipulate it, reconstruct/ reconstitute it using Elemental Spiritual Pressure. Izanagi appearance during his Bankai release would have also changed. The Shinigami would now have 3 Shuriken Mirrors, which replaced his Zanapakuto. The Shuriken Mirrors will be 4ft wide and dark in appearance. On the back on each Shuriken Mirror will be a Golden Dragon. There will be a handle on the back of each Shuriken Mirros, which of course the man can hold onto. These handles will allow him to use the Shuriken Mirrors as a shield. The Shuriken Mirrors will have a total of 8 blades each on all of them. The blades will be carefully spaced out, with the same calculated gap between each one. As expected the Shuriken will have a mirror, which takes up most of the Shuriken. The Mirrors on the Shuriken will be used to fire off various attacks, on a whim. The Shuriken Mirrors will of course be manipulated by Izanagi and will be under his control. They’re able to spin at immense speeds and possess great cutting and destructive power as they move. The Shuriken Mirrors themselves carries the same freezing temperatures too. In addition to his weaponry change, Izanagi will give a pair of draconic wings. The wings no doubt grant Izanagi the ability to fly and to even defend against incoming attacks. The Shinigami will also gain a pair of draconic tails. These things are of course made of ice, as most things are. This of course excludes his Shuriken Mirrors that are actually his Zanapakuto at this stage. The Shinigami will also gain a crown made of Ice on his head. Izanagi’s main attire would still be the same and will only undergo minimal changes. Ryuujin’s Bankai ability is the same as its Shikai state. Except that Izanagi’s spiritual pressure which is intertwined with the ice. Slows down the spiritual pressure of the person that is near it. And will completely stop the flow of energy on the part of the body that the ice is on. Those that are within a few feet to five yards will slow down their spiritual pressure by 1/8. Those that are within two feet or below spiritual pressure will be halved. And by touching the Ice will completely slow down the flow of spiritual pressure on that part of the body. Effect: Soukoyari generally manifest itself as Ice spikes that are formed and controlled by Izanagi. The Shinigami may choose to have the Ice spikes form around him (materializing). Soukoyari also allows for versatility, allowing Izanagi to have these Ice spikes rise from the ground. The Shinigami may even release an overwhelming but focused torrent of these Ice spikes at his opponent. The spikes can rise from anywhere between 1 and 15ft long and up to a foot wide. The Ice spikes can of course rise or appear in vertically or even diagonally etc. The purpose of the Ice spikes is to pierce Izanagi’s opponents (typical). One must not forget that while manipulating this already existing Ice. There is always a chance that the condensation in the area can be used to augment this technique. Damaging power is increased when they are mounted or meshed in any particular way together. Effect: Ryukousei summons forth a large 24ft long Dragon that is 10ft wide to the battlefield. The dragon is of course manipulated by Izanagi and will be under his control. Using elemental spiritual pressure, Izanagi is able to change the dragon’s state from a liquid to a crystallized form at will. The Shinigami will at times break this down and have the dragon reassemble itself into various weapons etc. Ryukousei has the same ability to affect/slow down the opponent’s reiatsu as stated in its Bankai state. The dragon is of course made of ice. Effect: Ryuuza Arashi relies on the already existing condensation in the area. The condensation will be gathered and sent into the clouds. Once this deed has been done, the resulting effect will call forth what seems to be the eye of a storm. There will be a maximum of 5 of these things appearing in different locations in the heavens. The amount will depend on the stages of the Zanapakuto, three for Shikai and 5 for Bankai. 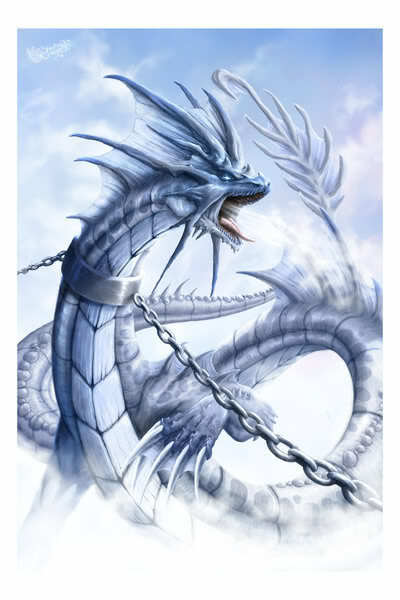 The idea of Ryuuza Arashi is to have the Dragons made of Ice that are 24ft long and 10 ft wide descend from the heavens. The Dragons tend to descend very swiftly at great speed, descending with a high volume of water. The Dragons are of course manipulated by Izanagi. The purpose of the dragons are to implode once the prey has been caught. This will then cause seemly countless Ice spikes to pierce the opponent as well as freeze them over. This results in several obelisk being formed where the opponent was caught. As expected the Dragons possess the ability to affect the opponents spiritual pressure. Ain't good, but ain't bad either. I approve of this without any comments. Except that I'm troubled.